Raise your little girl with a proper denim education. Five-pocket jean flaunts a skinny fit for a stylish look. 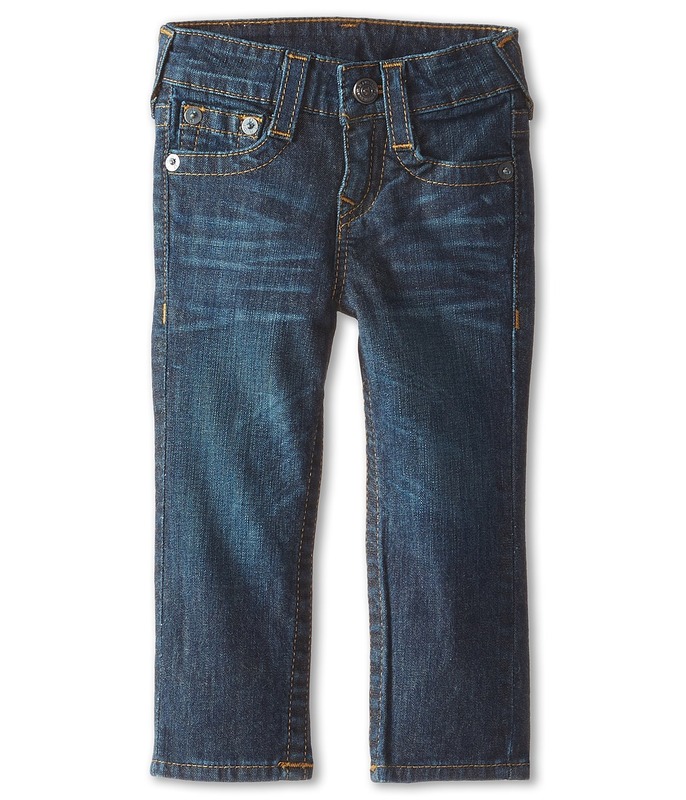 Flower Dust is a faded dark blue wash on 9.5 oz stretch cotton denim. Snap-flap back pockets feature the classic logo. Rose single-end thread. Stainless snaps and copper rivets. Belt loop waistband. Interior waistband is adjustable. Zipper fly and snap-button closure. 98 percent cotton, 2 percent spandex. Machine wash cold, tumble dry low. Imported. Measurements: Waist Measurement: 18 in Outseam: 17 in Inseam: 10 1 2 in Front Rise: 5 in Back Rise: 7 in Leg Opening: 7 in Product measurements were taken using size 12 mos. Please note that measurements may vary by size. A modern classic. 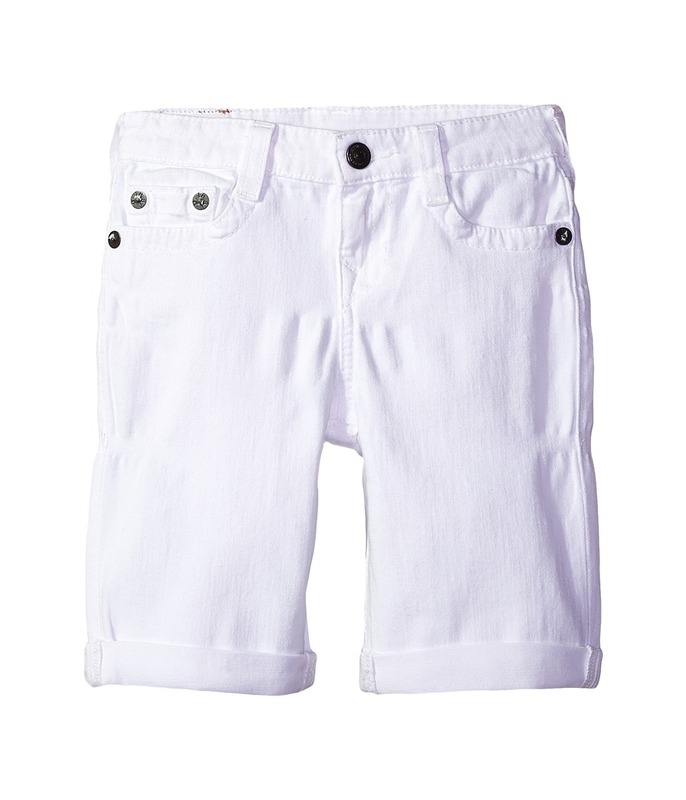 Five-pocket shorts crafted in a stretch-cotton denim. Classic logo at back pockets. Belt-loop waist. Brand patch at back waist. Belt loop waistband. Zipper fly and snap-button closure. 98 percent cotton, 2 percent spandex. Machine wash cold, tumble dry low. Imported. Measurements: Waist Measurement: 27 in Outseam: 18 in Inseam: 10 in Front Rise: 7 in Back Rise: 10 1 2 in Leg Opening: 16 in Product measurements were taken using size 10 Big Kids. Please note that measurements may vary by size. 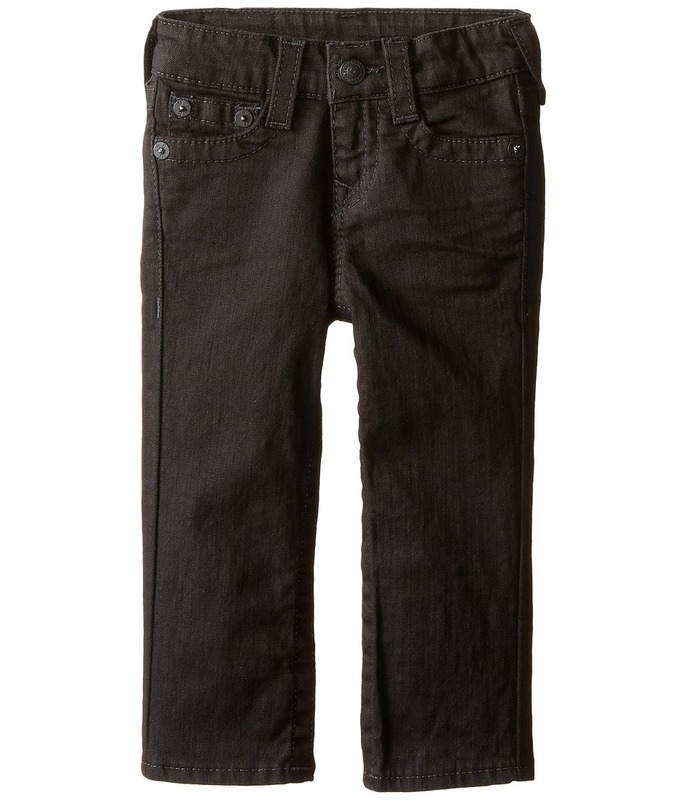 His peers won~t be able to resist his cool, stylish influence in this awesome True Religion Kids tee! 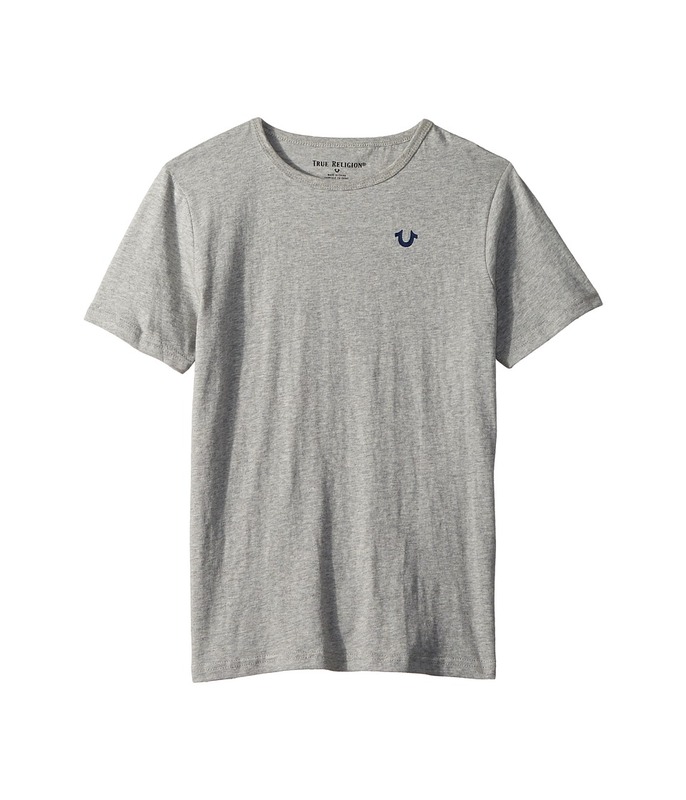 Cotton tee features brand graphic at front and back. Ribbed crew neckline. Short sleeves. Straight hem. 100 percent cotton. Machine wash cold, tumble dry low. Imported. Measurements: Length: 17 in Product measurements were taken using size 2 Toddler. Please note that measurements may vary by size. With jeans this chic, they must run in the family. The Casey jean sports a super skinny leg. 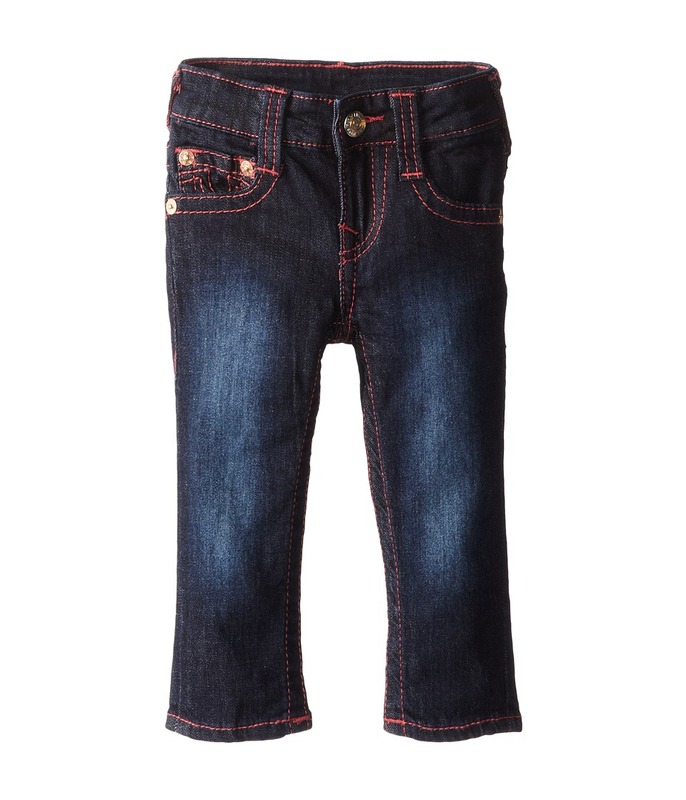 Stretch denim rocks rocks whiskering and slight fading down the thighs. Five-pocket design. Contrast stitching. Classic logo stitched on rear pockets. New brown brand patch at back waist. Belt loop waistband. Zipper fly and button closure. 75 percent cotton, 22 percent polyester, 3 percent elastane. Machine wash cold, tumble dry low. Imported. Measurements: Waist Measurement: 24 in Outseam: 33 in Inseam: 23 in Front Rise: 8 in Back Rise: 10 in Leg Opening: 10 in Product measurements were taken using size 10 Big Kids. Please note that measurements may vary by size. Have him looking sharp in the Geno jean! 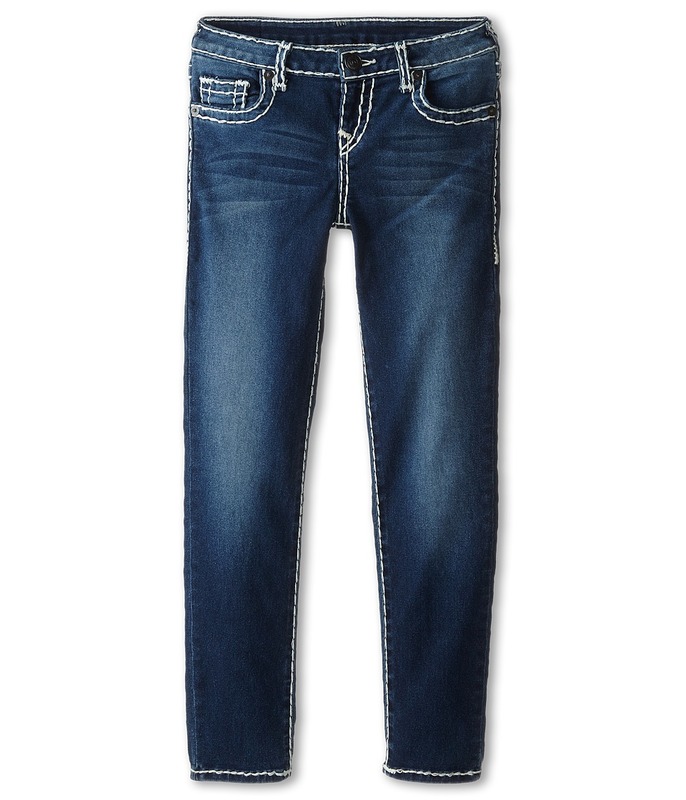 Five-pocket jean sports a slim straight leg. Dark Indigo wash is presented on stretch cotton denim. Flat back pockets feature the classic logo. Contrast stitching. Pewter hardware. New brown brand patch at back waist. Belt loop waistband. Interior waistband is adjustable. Zipper fly and snap-button closure. 98 percent cotton, 2 percent spandex. Machine wash cold, tumble dry low. Imported. Measurements: Waist Measurement: 20 in Outseam: 19 1 2 in Inseam: 13 in Front Rise: 6 in Back Rise: 9 1 2 in Leg Opening: 9 in Product measurements were taken using size 2 Toddler. Please note that measurements may vary by size. A modern classic. Five-pocket jean crafted in a soft, stretch-cotton denim. Super Fly is a slightly faded black wash with three-dimensional whiskers. Snap-flap coin and back pockets feature the classic logo. Single-end thread topstitching. Gunmetal hardware. Black leather patch at back waist. Belt loop waistband. Zipper fly and button closure. 98 percent cotton, 2 percent spandex. Machine wash cold, tumble dry low. Imported. Measurements: Waist Measurement: 21 in Outseam: 19 1 2 in Inseam: 12 1 2 in Front Rise: 7 1 2 in Back Rise: 10 3 4 in Leg Opening: 10 in Product measurements were taken using size 2 Toddler. Please note that measurements may vary by size. Cotton jersey tee flaunts the classic laughing Buddha screen printed on the front. Relaxed fit. 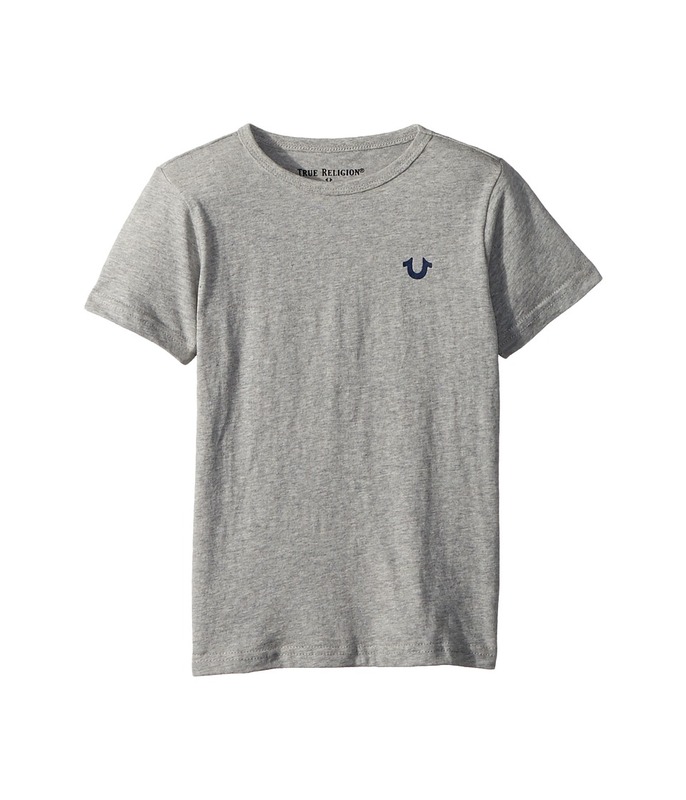 Soft cotton jersey. Crew neckline. Short sleeves. Straight hemline. 100 percent cotton. Machine wash cold, tumble dry low. Imported. Measurements: Length: 21 in Product measurements were taken using size 7 Little Kids. Please note that measurements may vary by size. 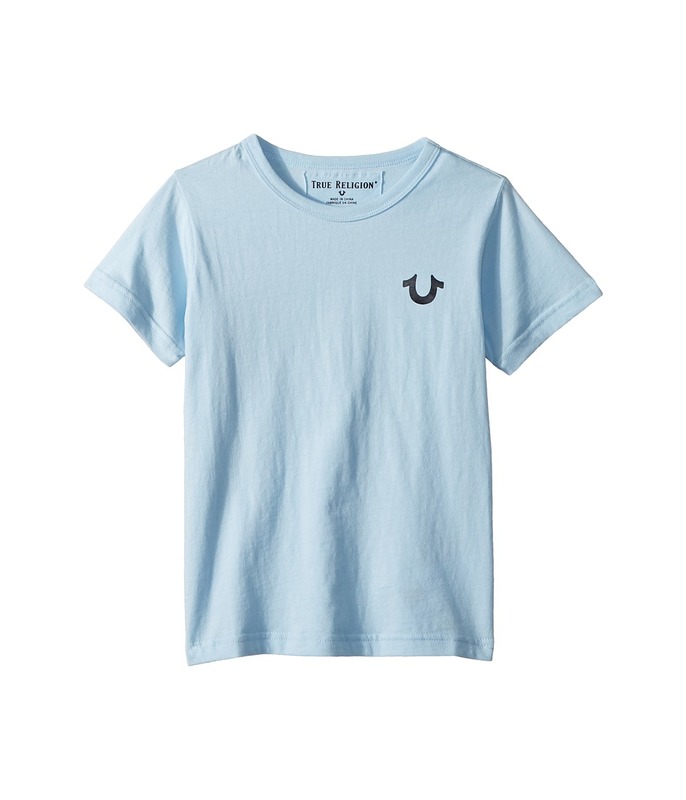 His peers won~t be able to resist his cool, stylish influence in this awesome True Religion Kids tee! Cotton tee features brand graphic at front and back. Scoop neckline. Short sleeves. Straight hem. 100 percent cotton. Machine wash cold, tumble dry low. Imported. Measurements: Length: 27 in Product measurements were taken using size XL (18-20 Big Kids). Please note that measurements may vary by size. 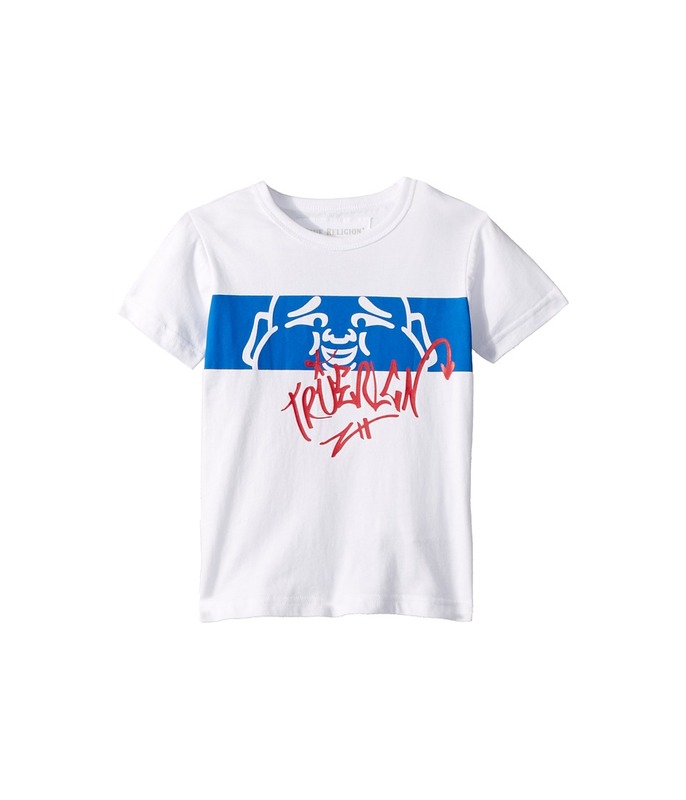 His peers won~t be able to resist his cool, stylish influence in this awesome True Religion Kids tee! Cotton tee features brand graphic at front and back. Scoop neckline. Short sleeves. Straight hem. 100 percent cotton. Machine wash cold, tumble dry low. Imported. Measurements: Length: 20 in Product measurements were taken using size 7 Little Kids. Please note that measurements may vary by size.